Why: The Author is active on Fantasy Faction so I checked her out, and I liked the pitch of the book. Description: When Tudor explorers returned from the New World, they brought back a name out of half-forgotten Viking legend: skraylings. Red-sailed ships followed in the explorers’ wake, bringing Native American goods–and a skrayling ambassador–to London. But what do these seemingly magical beings really want in Elizabeth I’s capital? Review: This was my first foray into historical fantasy, and if all of it is this good I’m going to have to read a lot more of it. The story takes place in an alternate version of Elizabethan England, where the Virgin Queen of yore has actually married and has two adult sons. If the book stated an actual date when the action takes place I have forgotten it, but since this is an alternate reality it’s not really relevant. The other significant difference is that when the explorers discovered America, they also discovered a race of people called skraylings. They are disconcertingly alien to humans, with their slit-pupiled eyes, pagan customs and strange magic, even if otherwise they don’t look too different. However, they are also important trade partners, and as such there is a slightly uneasy relationship between humans and skraylings. Added to that there is the tension between England and Spain and the old division of catholics and protestants, which all makes for a volatile climate. Thrown into the midst of all this is our hero, Maliverny Catlyn. Mal is a trained swordsman but down on his luck and desperate for money when he is offered the position of bodyguard to the skrayling ambassador, who is coming to London to strengthen the ties between the English and the skraylings. This includes being the judge in a competition between theatrical companies for who puts on the best play. Mal is hesitant due to a dark, skrayling-related event in his past, but cannot really afford to decline the offer. The plot pretty much centres on that – Mal’s history with the skraylings and the playwright competition, but even though that sounds slight, the book is never boring. I have often mentioned the ‘debut novel syndrome’, but even though this is Lyle’s debut novel (insofar as I could see), there was nothing of that to be found here. The writing is assured, evocative and engaging, and all the characters are fully fleshed-out. Since I’m Dutch I’m not as well-versed on my English history, so apart from the bit about Elizabeth the First having married I don’t really know what is authentic and what has been changed, but I really liked the fact that one of the secondary characters is a Dutch girl disguised as a boy, having fled the war with Spain in the low countries. I also liked the fact that Mal’s best friend is gay and in a relationship with one of the actors. I don’t know how historically accurate it is that people more or less turn a blind eye to it, but this was of course the time when male actors played all roles, even the female ones, because having a female on stage would be sacrilege, so I can very well imagine that the profession would have attracted gay people. The final part of the book where various matters are resolved felt a bit overly easy to me, but on the whole I very much enjoyed it, and I’m looking forward to reading the remaining two books in this trilogy. I would also like to say that I absolutely adore the cover of this book. I commend the artist on a perfect rendition of Mal. 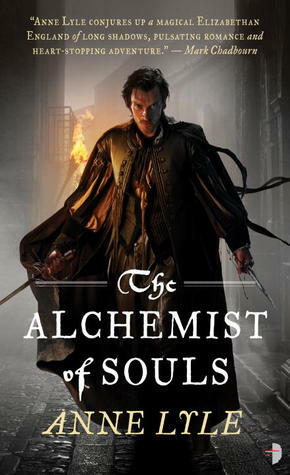 This entry was posted in Reviews and tagged Anne Lyle, Author, Books, Coby Hendricks, Fantasy, Fiction, Four stars, Historical, historical fantasy, Mal Catlyn, Maliverny Catlyn, Review, Reviews, Silk Screen Views, The Alchemist of Souls on December 20, 2013 by Erica Dakin.